Montu is a giant, third-party world with an Egyptian theme, created for Creatures 2 by Chaos Development. Montu has more than 300 new rooms with brand new graphics and features, such as a Grendelsphinx, a snake pit, Pyramids, Torture Rooms with dangerous objects, a new weather system that allows flooding and sandstorms, and also around 40 brand new objects such as a new Incubator, camels, mummies, and snakes. 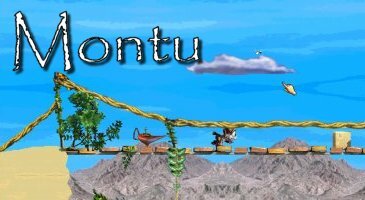 Montu is filled with new challenges and objectives that can be completed by Norns. It also comes with the Igua Norns, a new breed with new genetics and sprites by Darcie. "Welcome to Montu!... Montu is a new world for Creatures 2 which you can purchase, online, in the Chaos Store. It is held in ancient Shee mythology that when the Shee left Albia in a spaceship, that a couple of Grendels stowed away on board. The Shee attempted to fight them off and blasted several out into space. The Shee, eventually left the spaceship because of the Grendels, and found a 3D world. The Grendels that got blasted out into space eventually found Montu. The Grendels proceeded to colonize Montu turning it into their own ideal planet - full of dangers. They even captured the Igua Norns, a breed that the Shee had invented with plans to introduce them into the 3D world that they were in search of. These Norns need saving. With your help they can be set free. Montu is full of treasures, dangers, treats, a new Norn breed with a new sprite set and a new ecosystem with rooms that flood and rain that can settle. There are challenges to take on which can lead to fun and also danger for your Norns. For example, your adventures may lead to the discovery of a cure for all the dangers in Albia, or you may discover gadgets to control certain room properties. Perhaps you'll find the Igua Norns. Perhaps you'll find a runaway mine cart ride? There's plenty to see and discover. See also: the C3/DS Monturarrium. This page was last modified on 6 March 2019, at 14:35.